The National REDD Coordination submitted an Emissions Reduction Program Idea Note (ER-PIN) for the Mai Ndombe region to the Carbon Fund of the Forest Carbon Partnership Facility (FCPF) in 2013. DRC has been participating in the REDD+ SES Initiative since 2013. 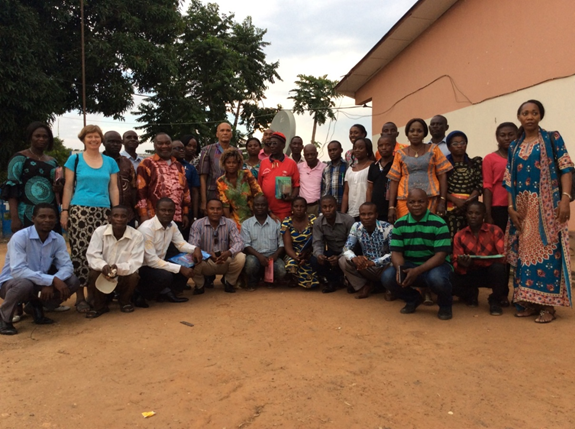 In January 2014, a capacity workshop building on safeguards and REDD+ was facilitated by WWF for 17 participants from civil society and local government in Bandundu, the provincial capital of the Mai Ndombe region where the ER Program is being developed. The participants included groups from the provincial government, from local NGOs active on environmental and safeguards issues, and indigenous peoples representatives. The two-day workshop provided an opportunity for them to ask many questions and to learn about safeguards issues to help them to participate in and understand the ER Program development process. © KKM-SamuelAnother capacity building and planning workshop for the multi-stakeholder working group that is developing the approach to safeguards and SIS for the Mai Ndombe ER program (GT5) was organized in November 2014. As an output of the workshop, the group produced a work plan for the development of the safeguards and non-carbon benefit information system and started the process of adapting indicators from the national social and environmental standards developed in 2012. To continue strengthening stakeholders’ capacities to engage in the development of the ER-Program, a capacity building workshop was organized in May 2015 with 28 stakeholders including representatives civil society, Indigenous Peoples, local communities, local government in Bandundu. The report of the workshop is available here.